Last October, 8 pieces of public art went up in South Main, the perfect addition to downtown's art district. This Friday, after "Hook Up, Clean Up, Bottoms Up," take a stroll and check them out. The art is by 13 artists: Jonathan Auger, Brendan Lawton,Ben Avant,Ryan Morris, Chris Hoal, Marcellous Lovelace, Brandon Marshall, Kenny Hayes, The Metal Museum, Nick Pena, Lance Turner, Stephanie Crosby, and Esther Szisk. Photographs and descriptions are posted on the S. Main Assoc. website. Click HERE. 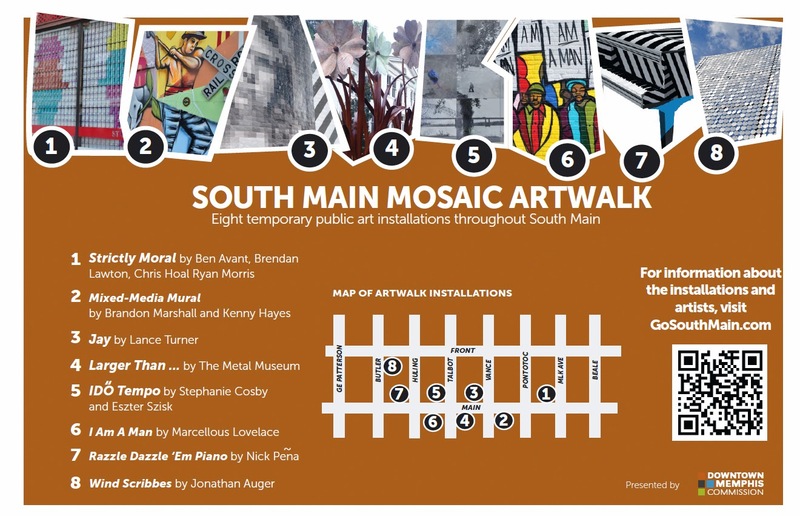 South Main Mosaic Artwalk is a Downtown Memphis Commission project.